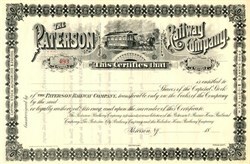 Beautifully engraved unissued certificate from the Paterson Railway Company printed in 1888. This historic document was printed by John c. Raken, N.Y. and has an ornate border around it with a vignette of the Paterson Horse Railway. This item is over 118 years old. We are only aware of five of these certificates to exist and believe they are quite rare.